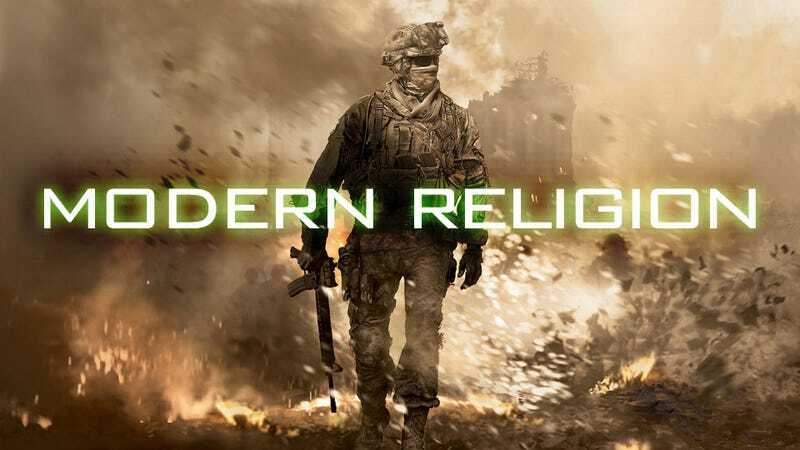 Few video games deal with the touchy subject of religion seriously. When they do, they often deal with the more fantastical outlying bits of different faith systems, like last year's Dante's Inferno, or the upcoming El Shaddai: Rise of the Metatron. Rarely do we see games that hunker down and deal with real questions of faith and the questions that surround faith. Traditionally, historically, video games and religion don&apos;t mix. When looking at game franchises like Modern Warfare, Fallout, and Killzone, one can't help but notice that belief systems are radically absent from the mind of the characters that we play as and interact with. In the face of horrific and devastating circumstances, there is no hint of the theodicy or the fox-hole conversion. In situations where human beings are faced with some of the most dire and core-shaking experiences, no one asks the basic human questions: Is there a God? If God is good, how can any of this happen? Games like The Witcher stand out, boldly presenting a character who is an atheist, yet also sympathetic to the theistic characters in the game. Unafraid to ask difficult questions, games like this simply feel more real and fleshed out. Can we imagine a world where, after nuclear holocaust, the human race simply stops asking the question "Where is God?" This rings totally false when we consider the devastated idealism of the 19th century that crumbled with the ruin of whole generations of European youth in the early 20th century. It's verisimilitude falls to pieces when we consider the Jewish religious, philosophical, and psychological (i.e. Frankl) response after Dachau and Bergen Belsen. When we consider even a single parent's questions when a child dies (i.e. Kushner), such a world seems devastatingly shallow. We have done incredibly well portraying evil in the gaming industry. We have succeeded in showing horror, devastation, and images of tragedy. But we have failed at portraying real human response to that horror. When driven to desperate situations, people, even jaded North-Easterners like myself, turn to God even if we laugh at ourselves a couple of years later. The Mosque, the Church, the Synagogue, and the Temple, all fill when the world burns. How is it then that we have almost totally missed this in gaming? Perhaps we have missed it because we are afraid. Perhaps we fear even greater backlash from the media. Showing a Rabbi who has lost his faith because his whole congregation was wiped out in a nuclear strike might make Jewish groups mad. Showing a Priest who has converted to Hinduism because he finds the answers there more helpful after seeing the world he knew destroyed by war might draw fire from the Catholic or Episcopal Church. Showing a Muslim man fighting next to an atheist to defend their homes might raise the ire of Muslim groups. Doing any of these things might be bad for business. Perhaps we don't do it because players don't seem to want it. "Don't get your religion in my games" seems to be a common response on many message boards. But I think this is for fear of games like "Left Behind" which attempt to proselatize. The purpose of games is not to convince people of one point or another, but to have fun. For many people, that fun has to do with how well a story is told, and how real the characters are. Good stories often ask questions about ultimate reality. If games are to grow as an art form, and not just a consumer product, our stories need to ring more truly in the ears of those who hear them. God, whether you believe in God or not, plays a part in that, whether it is by defining oneself against the larger culture by being an atheist, or by affirming a belief in God in the face of watching your friend bleed out on the battlefield. These are real life decisions, and if we are to tell real human stories, they belong in our games.